Give every student the help and enrichment they need. Take a look inside two schools to discover the innovative ways they developed systematic interventions programs. Discover practical strategies to build Tier 2 intervention and enrichment periods into the school day, and learn how to work in collaborative teams to create targeted interventions and overcome implementation challenges to ensure all students are successful. 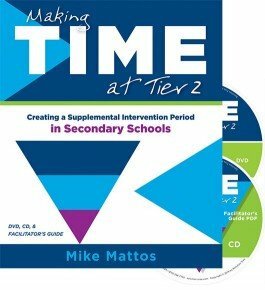 Learn how to revise schedules to build intervention periods without extending the school day. Recognize the elements that define an effective intervention program. Observe educators discussing and developing systematic interventions to guarantee that all students learn at high levels. Explore how to create intervention and extension periods through activities provided in the Facilitator's Guide.